Tipplers are ‘Chain Driven’ machines used for applications where containers have to be lifted prior to tipping. 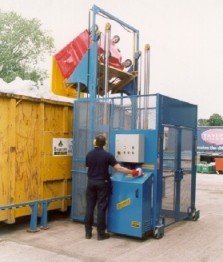 One great advantage of a Tippler is in it’s height, where it can lift a container (to be discharged), from a range of approximately 1.5 metres up to 15 metres. 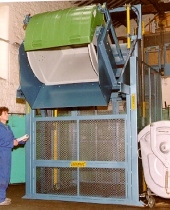 The tipping angle can reach up to a maximum of 180 degree of discharge with loads ranging from 25kg up to 2 tonnes (depending upon model required). Tipplers can accommodate goods that are reluctant to discharge, for example damp powders or food (sauce) products. 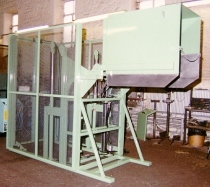 These are designed to lift, tip and discharge contents from containers at a final angle of 180º and be customised to include vibratory systems. These systems are perfect for applications that are of high value and where minimal wastage is critical, such as titanium powders. Gross loads of up to 2000 Kg are considered.